Ok I got my 2001 S-Type. About 4 years ago I changed the A/C compressor and Dryer at a a friends shop using aftermarket parts and the air started working OK. After it going in and out I decided to take it to a reputable A/C shop this summer and they told me that the compressor was bad and had to be changed. They changed it and it blew cold air like it was winter time in Minnesota. Fast Forward 2 months (maybe 3) and I thought I felt the air warm sometimes but it would always get cold again. Then 2 days ago I'm driving down the street and I notice the car overheating. No smoke I just got the warning lights and noticed the gauge. I turned off the A/C and it immediately went back to normal. 10 minutes later I turn the A/C back on and everything is working just fine until today the air is NOT cool at all. I can obviously take it back to the A/C place as its under warranty but since its sunday and its closed I thought I would check to see if anybody in the forums had any thoughts. I thought I felt the air warm sometimes but it would always get cold again. Then 2 days ago I'm driving down the street and I notice the car overheating. No smoke I just got the warning lights and noticed the gauge. I turned off the A/C and it immediately went back to normal. For the moment, I'd suggest putting the AC on the back burner. Figure out exactly why the engine got hot and correct that. It may be related to the AC issue, but who knows. I'd highly suggest running a pressure test on the cooling system. Also, make sure the radiator cooling fan is running properly. How fast were you going when the temp shot up? If below 30mph, the radiator fan may be the culprit. Above 30mph or so, you will generally have adequate ram airflow through the radiator. 10 minutes later I turn the A/C back on and everything is working just fine until today the air is NOT cool at all. For all we know, the current fault may be totally unrelated to any of the previous work. You can do a LOT of the steps in that guide with nothing more than a cheap pocket thermometer. For even better results, beg, borrow, or steal an infrared thermometer for checking the temperature of the coolant lines to the heater. In the guide, please start by first doing the steps in post #2, which makes sure the DCCV is operating properly. 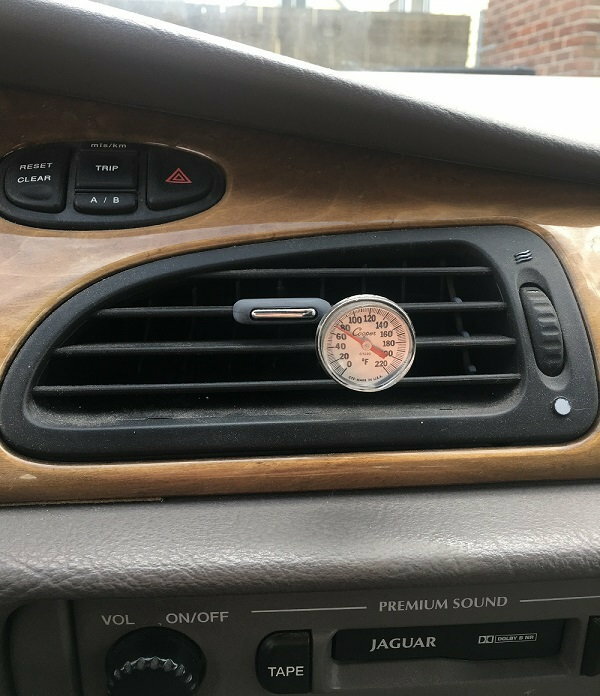 After that, use a thermometer in the dash to determine if you're getting some cooling (duct temp lower than ambient, even if not fully cold), or no cooling (duct temp equal to ambient). Also try playing around with the system in manual mode, which bypasses some automatic functions and is a boon for troubleshooting. Don't convince yourself the problem is related to past work. Go in with an open mind and troubleshoot based on the present symptoms. One thought that could account for the overheating AND erratic AC is crud in the cooling system. Debris may be blocking the radiator's internal passages and also jamming the DCCV open. The test of the DCCV in my troubleshooting guide will quickly rule out a problem affecting the DCCV. It's not a test of the cooling system itself, but it could help narrow down some possibilities. Thank for the insight Karl. I was only going about 30mph and had only been on the road 5mins. I'm gonna stop back by the A/C shop this morning before I look into it myself. Do you have the V6? The early V6 models have a special failsafe cooling mode. If the engine coolant temperature rises above a certain threshold, some protective features kick in automatically, including turning off the AC. If you have the V6, the apparent AC problem may have been a normal response to the engine overheating. Sorry I forgot to mention that yesterday. "The Ghost of Girlfriends Past"
Help.. ACM wont go past CD6...?